“A monthly index measuring signed contracts to buy existing homes fell 2.6 percent in August compared to July. That is the fifth drop in the past six months and below expectations,” according to the National Association of REALTORS as reported by CNN. We are missing the “move-up” market which is the backbone of the real estate market. We are still liquidating a large percentage of investor owned properties. “San Diego needs to roughly triple the number of homes it builds each year to keep up with demand and keep prices down, said a San Diego Housing Commission report ,” according to a story in the San Diego Union-Tribune. My question is where? The commission talks about increasing density in various ways because there is no more develop-able land in San Diego. I wish the politicians good luck with that if hey want to be re-elected. “More than half of registered voters in San Diego and Orange counties have considered leaving California because of high housing costs, said a poll from U.C. Berkeley’s governmental studies school,” write Phillip Molnar in the San Diego Union-Tribune. In the last couple of years I have worked with clients who have moved to Arizona, Wyoming and Idaho due to housing costs and quality of live issues in Southern California. CoreLogic statistics reported by the San Diego Union-Tribune indicate that the median price for a resale home in San Diego County was up 6.4% in August compared to last year. Diana Olick of CNBC reports on a “new” flat fee listing company. I’ve been offering flat fee listings for years. Real estates because of location, price, terms, condition and accessibility – not because of the name on the for sale sign. I’ve started creating 360 degree videos of my listings. The first is a video of a residential building lot overlooking Lake Hodges. This is new technology and the videos will improve as the cameras and editing software develop. 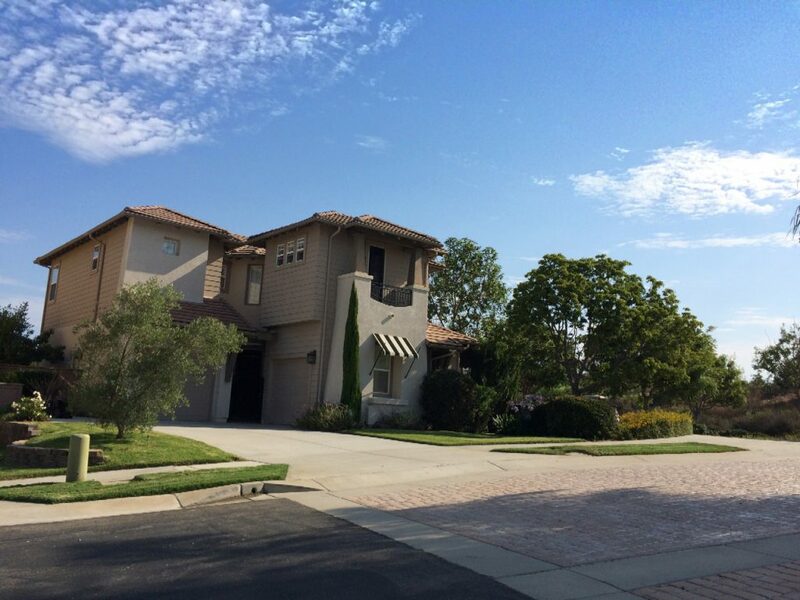 Encinitas Ranch three bedroom, two and one-half bath with 2,114 sq.ft. on premiere lot. Ocean and golf course views. Sold in one week for $1,070,000.00. “The San Diego median home price cooled slightly in July, ending a three-month streak of record-breaking peaks,” writes Phillip Molnar of the San Diego Union-Tribune. But that’s comparing June to July of 2017. The media always goes for the negative news to promote fear and anxiety. San Diego home prices were up 8.6% from June of last year but that’s not the headline they choose. CNBC’s Diana Olick reports that “In the past 12 months, 1.5 million borrowers bought their homes with down payments of less than 10 percent, marking a seven-year high.” But as far as I’m concerned Yogi Berra said it best, “it’s deje vu all over again.” I’ve read this headline at least four other times in my 40 year real estate career. If there is a small hiccup in market values these home buyers can be upside down on their home loans pretty quickly. In our new culture upside down home buyers walk away from their loan obligations, the banks take the properties and the housing bubble starts all over again. Not to worry, Uncle Sam will bail us out. “San Diego was one of the most expensive regions for home buyers in California in the second quarter of this year, with just 26 percent able to comfortably purchase the median-priced house,” reports The San Diego-Union Tribune. According to the article, lack of construction of new residential properties is a primary factor driving San Diego home prices higher.